GiderosPlayer.exe (or win Build.exe) causes error, with no log info. Same Project on v. 2016.10 on Win 10/Win 7 works fine, v. 2016.12 on Win 10 causes error, player exits with OS error. The hardest thing is the error is very hard to repeat, sometimes it appears sometimes only after restarting level, almost neer on first level load, but on other levels with same objects, error might not appear at all. Cant bring the code, because massive and cant be cleared so easily, I cant pub. real sources, unfortunately. Used (almost no changes): Box2d, Moveiclips, RenderTarget, TiledMap, GTween, Textures, Sounds. According it doesnt gives any log, I cant refactor my code to avoid this tiny place. Does anybody has thoughts about this ? Maybe any advices how to log this windows error. 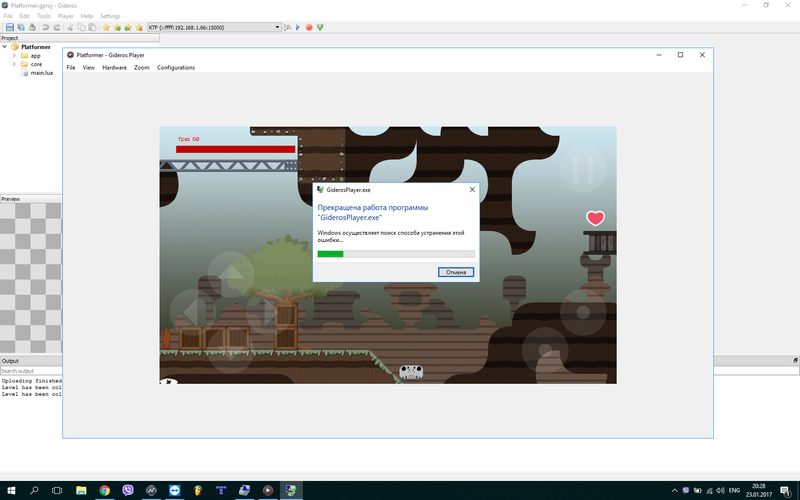 After adding mc:stop() Player drops error right after level starts !!! I hope this coming soon, spend a dozen time, until found I have different versions of Gideros home and at work, all builds, are falling at home... almost crying. Worst thing is that previous Gideros build was STABLE on this case. Why do they broke this ... as russian says: "Wanted better, did worst". Changing TexturePack to simple Texture aint helps. I think the fixed release will be today - keep an eye out. Why do they broke this ... as russian says: "Wanted better, did worst". Actually I broke it, it ought to be a fix for some unfrequent crashes, but the fix turned out to have unforeseen ramifications. But well, every new feature or fix is error prone! Well, its very familiar situation to me Ill be waiting for fix.